When my youngest sweetie isn't picking flowers or talking about picking flowers, she's picking berries from the bushes outside our house. She packs as many as she can into her tiny little palms of her hands until their overflowing. Anyway, I snapped these photos of her one day as she was picking those berries. The American Crafts My Girl collection was perfect for this moment! I kept my layering a bit more simple than I usually do. I was focusing more on the photos of course but also the the My Girl Stamps. I started out with 2x3 photos a tag and a card that I cut from a 12x12 sheet of paper. I wanted to add paint to give it a pop of color so I added pink Glimmer Glam to the stencil and then laid it down on the paper. I then mixed a batch of Gesso and blue mist to create a thicker paint. I applied it sparingly over the mask and laid it down over the paper again, alternating it over the pink. Then last but not least, I sponge painted grey mist from the center and outlined the mask. 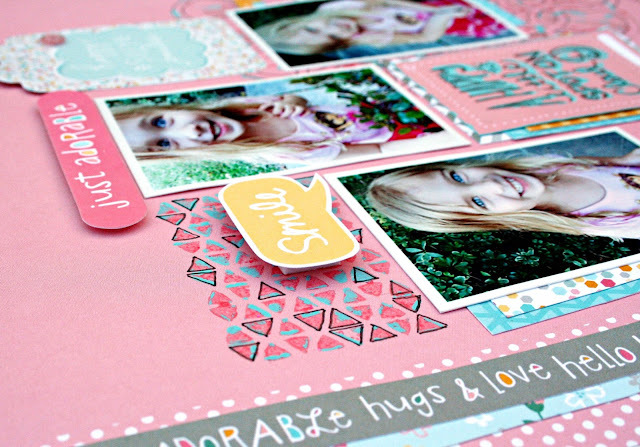 My favorite part of the painted elements is the simple little Cloud 9 stamp. I painted the blue Gesso on the stamp and applied it to the card. It was a bit "gloppy", which is what I was hoping for. It make the perfect background for the inked image that I eventually stamped over it. I repeated these techniques for the arrow and the diamond stamped image at the top. I'll be back tomorrow with a fun layout using the new Little Yellow Bicycle Fern & Forest Girl. 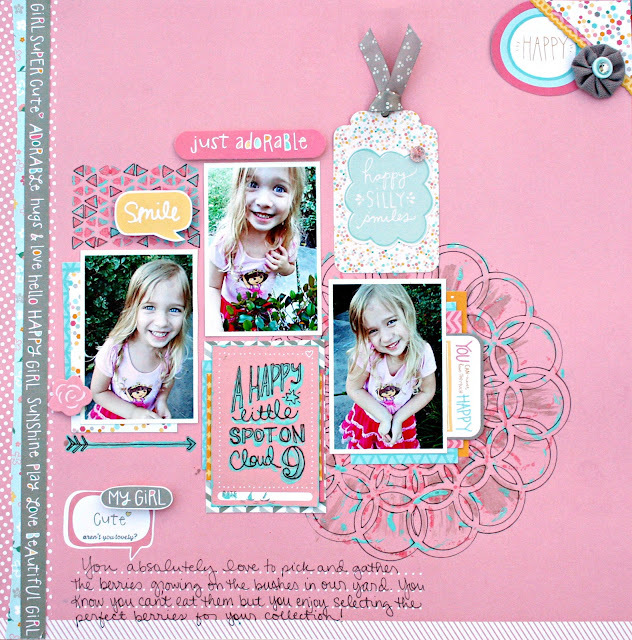 Heather - love this layout! Congrats on the little yellow bicycle design team. they are one of my fave paper companies and I enjoy doing business with them. Would love for you to stop by and link up you work on Whimsical wednedsay. This is simply fabulous! I love it! Heather. 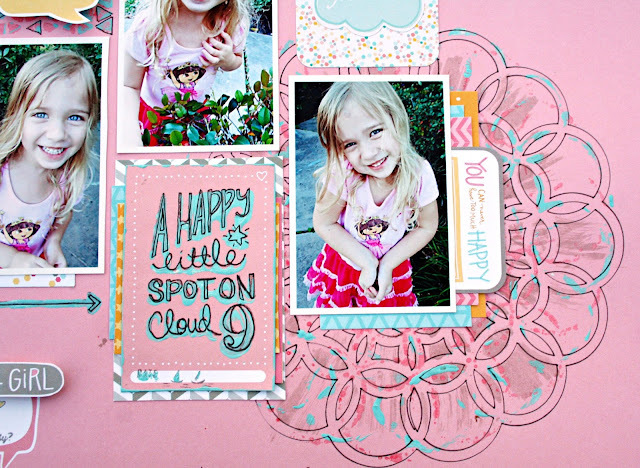 I am so happy you linked up your beautiful layout to Whimsical Wednesdays. Hope you will visit again. okay those pictures are seriously ADORABLE! GREAT layout!! So cute Heather!! Love the design on your page and such an awesome use of the My Girl collection!